Delphinium Cottage at Blakeney Quayside Cottages in Blakeney, near Holt, Norfolk sleeps 7 people. Blakeney Quayside Cottages near Holt are a collection of traditional properties which are set in the heart of the picturesque coastal village of Blakeney. Visit Blakeney for the first time and you will be sure to fall in love with it, as there is something very special about this village. From the quaint, narrow streets leading to the sea, to the picturesque quay, Blakeney is breathtaking whatever time of the year you visit. Hollyhocks Cottage (ref UKC2842 [Hollyhocks Cottage]), Delphinium Cottage (ref UKC2843), The Bittern (ref UKC2844 [The Bittern]) and Buttercup Cottage (ref UKC2847 [Buttercup Cottage]) are terraced properties, The Plover (ref UKC2845 [The Plover]) is a first floor apartment, and Cobble Cottage (ref UKC2846 [Cobble Cottage]) is semi-detached and all on one level. All have been decorated and furnished with loving care to embrace the traditional north Norfolk charm that these properties have in abundance. The properties are just a stone’s throw from the sea, and all are a great choice for your holiday. Make sure you make time for a spot of crabbing, a traditional Blakeney pursuit. If you can tear yourself away, travel west to visit Wells-next-the-Sea, Holkham, Brancaster and beyond, or travel east to Sheringham and Cromer, all of which offer a variety of sand and shingle beaches, picturesque quays and salt marshes. Bird watchers, walkers and cyclists will find ample opportunities to indulge in their hobbies, and foodies will be spoilt for choice as they find themselves in the heart of Norfolk’s burgeoning food scene. Whichever of Blakeney Quayside Cottages you choose to stay in, you will be sure to return. The beach, shop and restaurant are all 250 yards from Blakeney Quayside Cottages near Holt, with the pub 100 yards from Blakeney Quayside Cottages. These properties can be booked together to sleep up to 28 people. Living/dining room: With open fire, Freeview TV, DVD player, beams and wooden floor. Bedroom 3: With 3 2ft 6in beds. Economy 7 central heating included. Fuel for open fire available locally. Travel cot and highchair. External utility room with washer/dryer. Garden with courtyard (shared with other properties on-site). Sitting-out area with garden furniture. Bike store. All properties: Convector heaters, electricity, bed linen, towels and Wi-Fi included. On road parking; additional parking on public car park. No smoking. Holidays at Delphinium Cottage, Blakeney Quayside Cottages run from Saturday to Saturday. Pets allowed at Blakeney Quayside Cottages - Delphinium Cottage. For a better idea of where Blakeney Quayside Cottages - Delphinium Cottage is, you can see Blakeney Quayside Cottages - Delphinium Cottage on the map below. 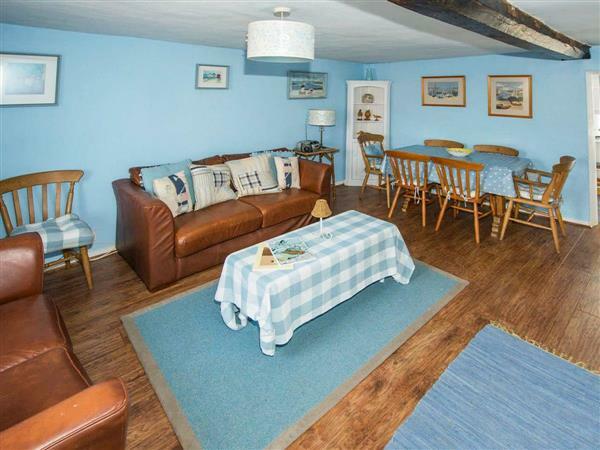 Blakeney Quayside Cottages - Delphinium Cottage is in Norfolk; should you be on the lookout for a special offer, you can find all the special offers in Norfolk. It's always worth checking to see what is on offer at the moment. Do you want to holiday near Blakeney Quayside Cottages - Delphinium Cottage (UKC2843), you can see other cottages within 25 miles of Blakeney Quayside Cottages - Delphinium Cottage; have a look to find your perfect holiday location.